“Woodlawn” movie on DVD from Universal Pictures Home Entertainment came from Netflix to our house this week. It’s got a mixture of football games and relationship intrigue in the storyline. This movie opened with a bus burning in Birmingham, AL in Martin Luther King, Jr.’s day, and is based on a true story. Woodlawn High School was forced to integrate African-American students with white students in the early 1970’s. Students and parents yelled and pushed while police shepherded the new young people from the bus through a pathway to their building. A top-notch football player catches the eye of the head coach of an Alabama University at a game, and he tells the high schooler that they’ll meet again. 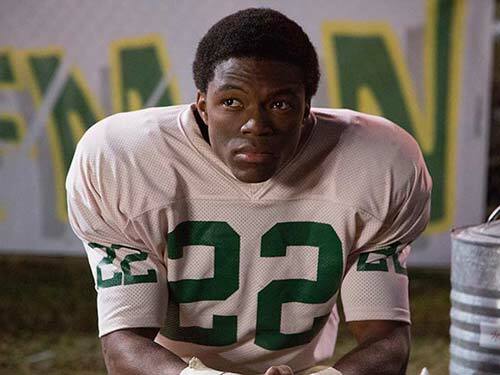 The next time we see Tony Nathan (Caleb Castille), he’s changing schools. Tandy Gerelds (Nic Bishop), is the vice-principal of Woodlawn High, and more importantly, the football coach. He’s not thrilled to have new players with a dark complexion, but he loves football and sees what an asset these young men will be to the team. To say that he protects the new guys from harsh hits at practice would be a lie, but he doesn’t encourage abuse as some rival coaches suggest to their squad. More folks attended that high school game than any other, ever. They got to view football players clash on the field, yet help opposite team members up from the ground after the play ended. I felt hope that Jesus can change hate-filled people to love-filled persons of God and of mankind. I’ve seen it and experienced it. I lived in that stressful era of uncertainty as society grappled with the assault on authority and the status quo. Our Ladies Bible study celebrated their 13 year anniversary today. It’s actually two days from now, but we meet on Wednesdays. We’ve been getting new people lately and I love how our group welcomes visitors. Occasionally, I jump too soon into giving a book away and the person never returns. The latest person, a young college student, rearranged her classes so she could attend today. She is going to memorize the worship songs and bring her guitar on Sunday with permission from the leader. I sought out a stranger in town today and found out she’s this young girl’s mother. They both have the sweetest smiles and joy in their hearts for the Lord. One never knows what a day will bring. Since I gave away our last spare book to someone that may not come back, I’ll ask this young person if she wants our Unglued tome by Lysa TerKeurst. My husband said since we’re almost done and if she doesn’t need the help that book gives, she may not want Unglued. I’ll ask her on Sunday. I’m going to try and remember to bring in a zucchini plant as well. Her mom thanked me for the cherry tomato plant one of the ladies gave her daughter. So delighted over a plant, it sparked the thought, I have four zucchini plants and a small space set aside for a garden. I offered her a zucchini plant and she smiled with such delight, it gave me a warm feeling inside. No wonder the Lord tells us to be thankful. It’s good for our attitude and I imagine it gives Him joy to be appreciated. Occasionally people scam other people – strangers or friends may steal. My dad determined in his heart whenever he lent money to hope for repayment but not to expect it. That way it didn’t get in the way of relationship. So, we opened our Bible study in prayer, as usual, but we included people we don’t know whose names or home cities were in the news. We prayed for victims and families of deceased victims and for perpetrators and we prayed evil ones would repent and get saved and stop hurting people. Then we remembered our loving, just, all-powerful God before we shared favorite Scriptures. A little later we celebrated 13 years of Bible studies and prayed for a continuation for as many more years as the Lord allows. Praise His name! Sometimes I’ll tell my husband that I feel like I’m in a spiritual battle. Big sigh. No big deal. That’s life. Today I pondered the idea of fighting back. Not taking kick boxing classes, (are those for fighting or getting in shape)? Anyhow, I thought of Christians all over the world being persecuted for their faith. Americans only face a little of that so far, although in the secular media I’ve noticed that the crazy guy with the ax often carries a Bible in the other hand. Right. I know a LOT of Christians and none of them are murderers. So, to get back to the fighting bit. I think every Christian should pick up their Sword of the Spirit – the word of God, and yield it with all their might, humbly on their knees in prayer. Can you imagine if every Christian in the world spent an extra five minutes a day repenting of sin and then praying for others, using God’s word to remind Him of His promises, and then listened quietly for another five minutes? I believe the battle in the heavenlies would rock our world like ISIS or that mean person in our lives never dreamed of. God wants us involved in this life for His glory and for His love to be spread to others through us. How can we love others if we’re not in communication with the Great I Am? We can only love and pray and serve and exist with the strength God gives us. When we try and do it on our own, we wimp out. We get tired, sick, discouraged, misdirected, maybe even feel manipulated. Even Jesus took time with the Father every single day. If God the Son needs time with God the Father to be re-charged, how can we go it alone? I’m just picturing more victory in this world when we all participate, because for some odd reason, God wants to include us in the heavenly realms’ battle, which impacts our sod.